The Arlington Way apparently still means asking questions so you get the answers you can use to promote more spending. The County Government is conducting its fourth resident survey, “2015 Arlington County, Virginia DirectionFinder® Survey,” a process of gathering information to direct/justify future spending. “This survey will help us find out how we’re doing across many different service areas – and also pinpoint where we need to improve,” said County Manager Barbara Donnellan. “The results will provide information to guide future decision-making, long-range priorities, and strategic planning,” according to the March 2015 release announcing the effort. The last survey, done in 2012, helped the County bureaucracy pat itself on its back. This unfortunately didn’t give some County Board candidates any idea which way the wind was blowing. Though the 2012 survey said, “Overall satisfaction with quality of services improved from 87 percent in 2008 to 89 percent in 2012,” one County Board candidate got hammered at the polls by running on tweaking the status quo. And there is even a 45-minute video presentation to the County Board about the 2012 survey. The County also used the 2012 survey to justify upping spending in areas such as affordable housing. “The survey also indicated opportunities for improvement in several areas, including: efforts to preserve affordable housing; efforts to preserve nature areas, and enforcement of local traffic laws,” according to the release. Q2. Which FOUR of the areas listed above do you think are most important to improve over the next TWO Years? [Select the letters below using the letters from Question 1 above]. If you say you’re “very unsatisfied” with any of these items, there’s no way to explain that ever-increasing spending in these areas isn’t the response you want. If you’re unsatisfied, then the County Government, at its discretion, will “improve” it, i.e., increase spending in that area, if the past is a predictor of future actions. Guess which answer I selected. There are more questions asking generally about satisfaction, or lack of it, but the County has left it to itself to decide what this means. Nowhere is there a question about whether the County Government is too large, taxes are too high, or whether the Arlington bureaucracy should reduce the scale/scope of what it’s doing. *To validate your input we need your street address and ZIP code so that we can verify only one person per household has taken the survey. I put in my real address, so probably those pot holes near my house are going to be there a while. 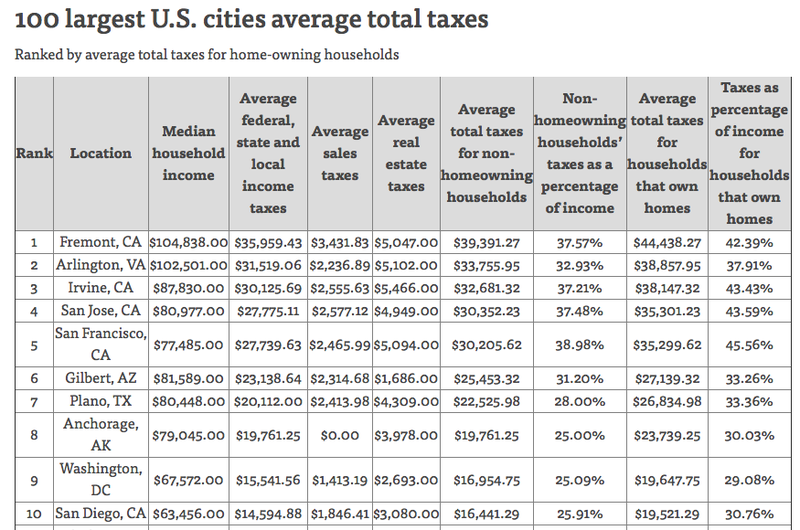 While neither the County Board or the County Manager saw fit to ask residents whether taxes are too high, thanks to Jeff Clabaugh of the Washington Business Journal in a story today, we learn that Arlington County ranks #2 on total tax burden among the 100 largest U.S. cities. The numbers come courtesy of an analysis by the financial website NerdWallet. The table below is from the Washington Business Journal story, but you numbers for all 100 cities is available at the NerdWallet website. And if the County asks, tell them ACTA sent you.